Site: It succeeds in most soils, preferring a moist shady position under trees where it often self-sows. The leaves tend to turn yellow when plants are grown in full sun. It is not winter-hardy, though plants can tolerate short periods at temperatures down to about 50°F. Mitsuba wants good watering, though (like most herbs) doesn't like "wet feet", so arrange for good. drainage. Growing: Mitsuba is commonly cultivated as a vegetable in Japan and there are some named varieties. It does not always survive the winter and so it is usually grown as an annual. The main problem with growing it is that the plant is adored by slugs and snails and must be protected when small or when new growth is emerging in the spring. Harvesting: Harvest a few leaves as needed. Left uncut, the plant can reach two feet in height. Keep the small, white blossoms trimmed. Note well that to preserve its fragrance, it should never be more than at very most briefly parboiled: add it to cooked dishes just before serving. 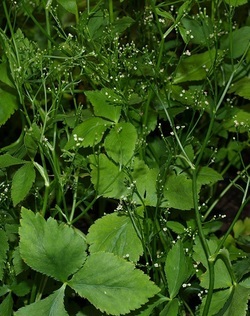 Culinary Uses: The leaves and stems can be eaten raw or cooked, they have a parsley like flavor. The seedlings and young leaves can be used in salads whilst older leaves are used as a flavouring. When cooking, the leaves should not be cooked for more than a couple of minutes or the flavour is destroyed. Use in soup or salad. Looks similar to Italian parsley. All parts of the plant can be eaten, including the roots and seeds. The attractive trefoil leaves are used in Japanese flower arranging, and the stems are tied in a knot to decorate dishes at Japanese weddings to bring good luck. The flavour is reminiscent of celery mixed with a bit of parsley, sorrel and coriander!